Are you interested in winning this Barrel Purse? We have had a lot of fun seeing all of your great comments and just feeding off of the excitement that giving away this Disney Dooney and Bourke purse has generated! However, there are only five days left to enter! If you haven’t entered to win this great gift — which, by the way, retails for $105 at the Disney Store — you can still do so! That, if you have not entered at all yet in this contest, you can still generate 66 entries to win the purse? That is a total of 66 entries! The contest will run from Midnight, March 25, 2013 until 11:59PM, April 1st, 2013 — and no, this is NOT an elaborate April Fools Joke! Winner Selection: The winner of the Sweepstakes will be selected in a random drawing from among all eligible Entries received throughout the Promotion Period. The random drawing will be conducted by 48 hours by Sponsor or its designated representatives, whose decisions are final. Odds of winning will vary depending on the number of eligible Entries received. Winner will be notified by email at the email address provided in the Entry Information on or about 48 hours after the random drawing. Potential winner must accept a prize by email as directed by Sponsor within 48 hours of notification. Any winner notification not responded to or returned as undeliverable may result in prize forfeiture. The potential prize winner may be required to sign and return an affidavit of eligibility and release of liability, and a Publicity Release (collectively “the Prize Claim Documents”). No substitution or transfer of a prize is permitted except by Sponsor. Contest open to only residents of the United States or Canada, sorry! While you are thinking about strolling around Walt Disney World with your Disney Dooney, why not shoot me an email (or fill out the form on my Pixie Vacations Page) and see what kind of deal I can make for you to make that dream a reality? My services are free, but the level of service you’ll receive from me is second to none! 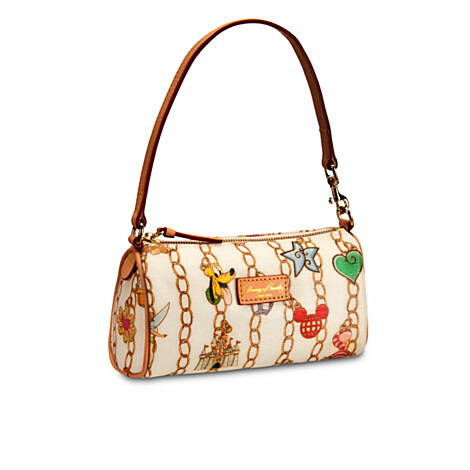 Who wants to win a Disney Dooney and Bourke Barrel Purse? Pixie Vacations Prize Pack Contest! While as a Mom I’m use to giving to my daughter’s and putting my needs second, this time I’m being selfish. I want to win this purse for ME…!!! I recently had to retire from teaching on March 14th because of MS. I have been teaching for 20+ years and I LOVED my job. So, because of that I planned a surprise trip for my family of 7 and I want to win this purse for ME…!!! <3 Disney. ability to absorb heat within the skin which is a precursor of acne. Previous Post: 84 Days til Disneyland – Minnie’s House! Next Post: Save up to 30% on Walt Disney World Resort stays with Disney Visa!